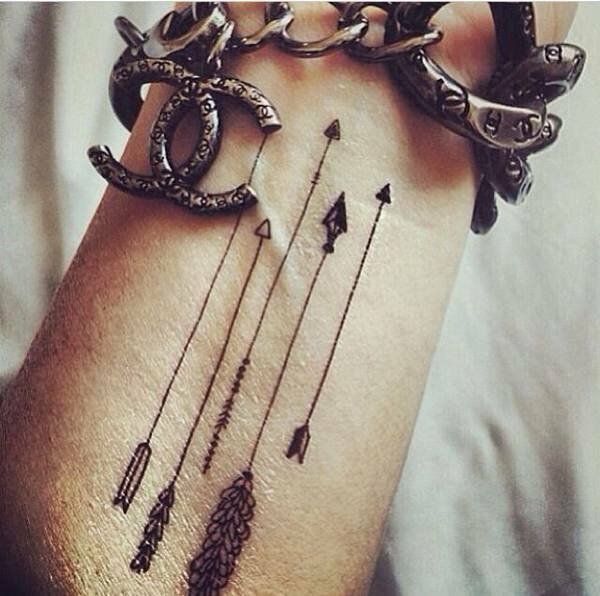 We love arrow tattoos. They’re cute, subtle, and quite chic. 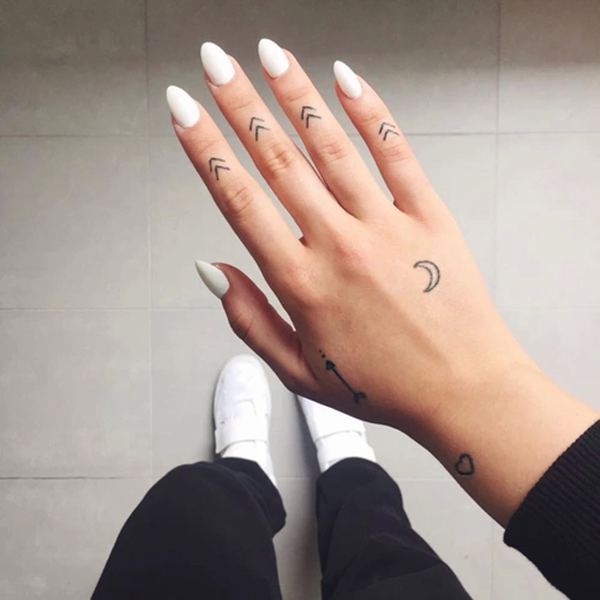 Plus, they’ve become hugely popular in recent years – they’re simplicity makes them the perfect choice for someone who’s getting inked for the first time. 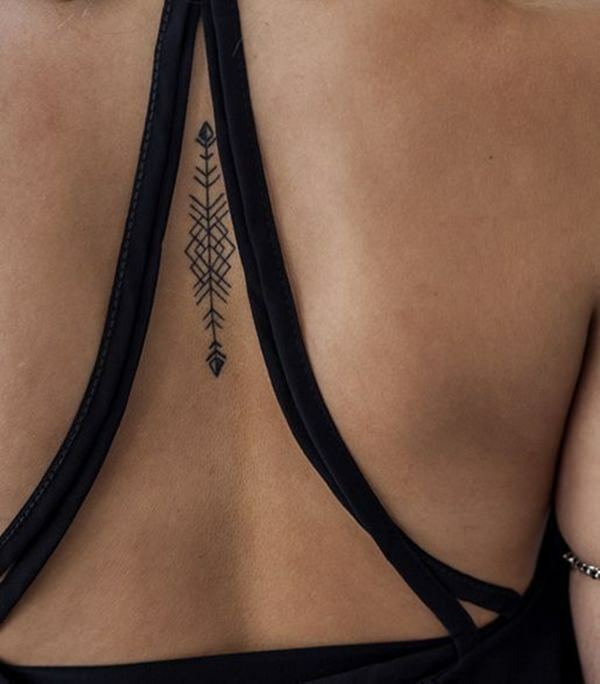 Sarah Hyland recently got a gorgeous one with her friends, which made us think a bit more about arrow tattoos and the meaning behind the design. 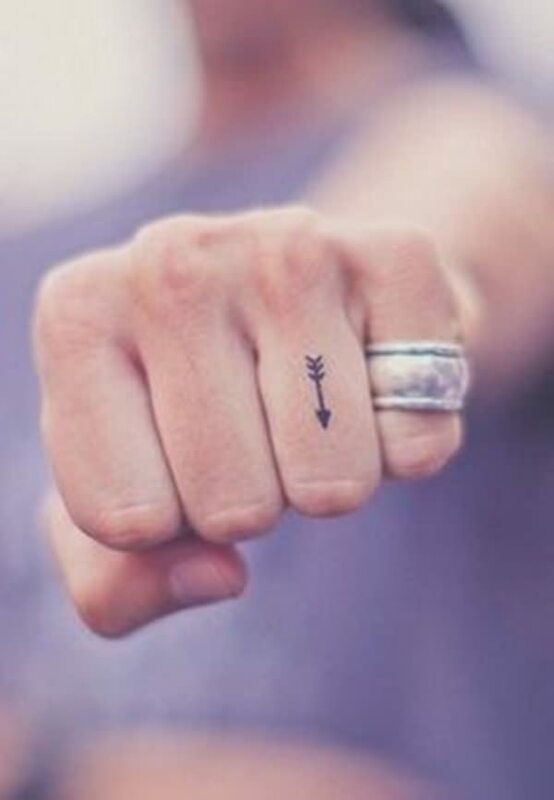 Would an arrow tattoo be a good pick for you? Read on to find out. 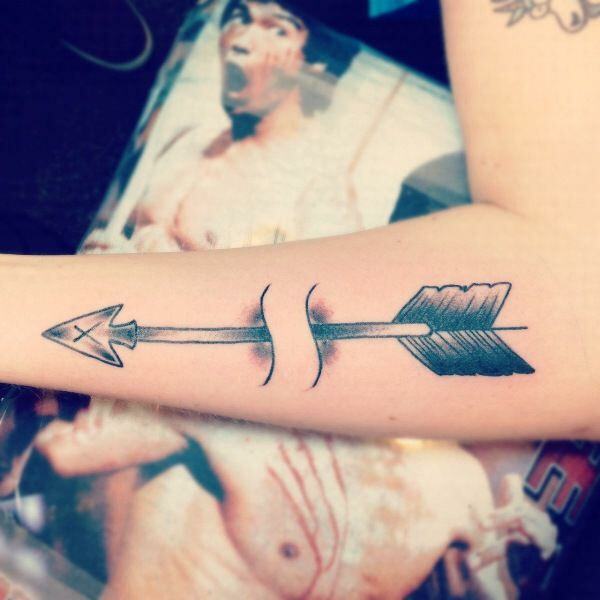 There are a lot of symbolic meanings behind an arrow tattoo. 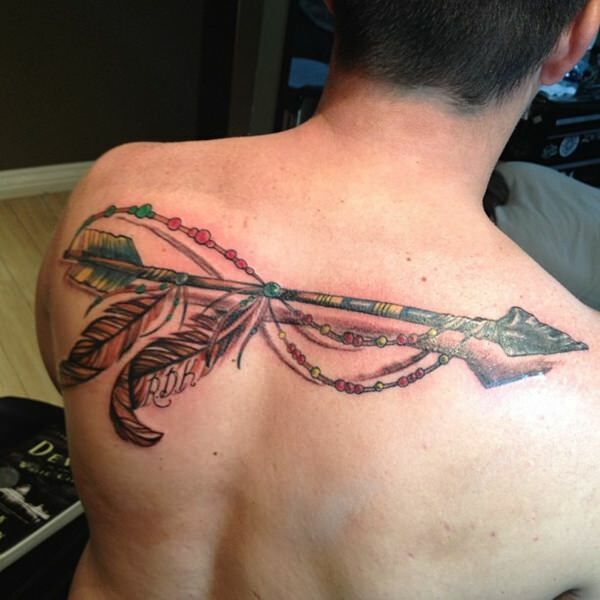 In the Native American culture, for instance, the arrow is seen as a weapon of protection and hunting. It is believed to safeguard one’s family, as well as help them provide food to sustain life. 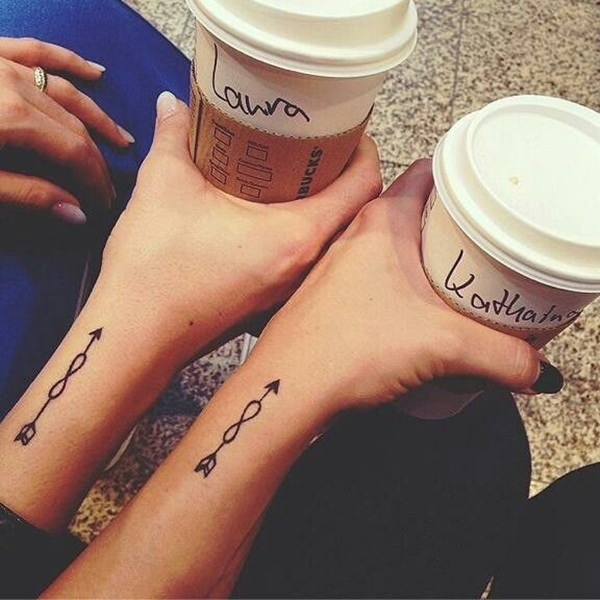 Two crossed arrows signify friendship – that’s usually why friends opt for matching arrow tattoos, to highlight the profound bond between them. 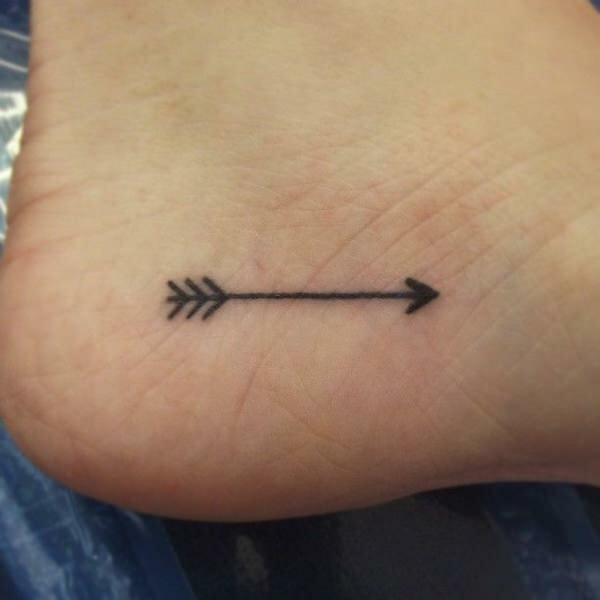 An arrow tattoo can also mean moving forward, despite the usual struggles that come along in life. A bow is seen as an obstacle, and the arrow being released signifies fighting to reach one’s goals and fulfill one’s life’s purpose. Despite the fact that the bow pulls the arrow back, the arrow then gets released and is free to move on and seek better things. You get the point. Another meaning can be tied to the Zodiac, where a bow and arrow stand for the astrological sign of Sagittarius. An arrow can also be a symbol for love – does Cupid’s arrow ring a bell for anyone? Moreover, it can be a symbol for strength and power, or it can signify a sense of direction: you’re moving forward without looking back. It can mean that you’re ready to leave the past behind, let go of mistakes or grudges, and seek better opportunities in life. At the end of the day, it all comes down to the meaning you find in the symbol, since you will be the one wearing it day after day. Ideally, it should be associated with a positive feeling, so that every time you catch a glimpse of it you are reminded of how strong you are or about how you’re fighting to reach your goals. You should also consider the placement of the arrow when choosing a certain design. If we’re talking about a small arrow, that’s the perfect size for your ankle, finger, or wrist. If you want a larger design, that can be inked on your shoulder, side, back, chest, leg, or arm. 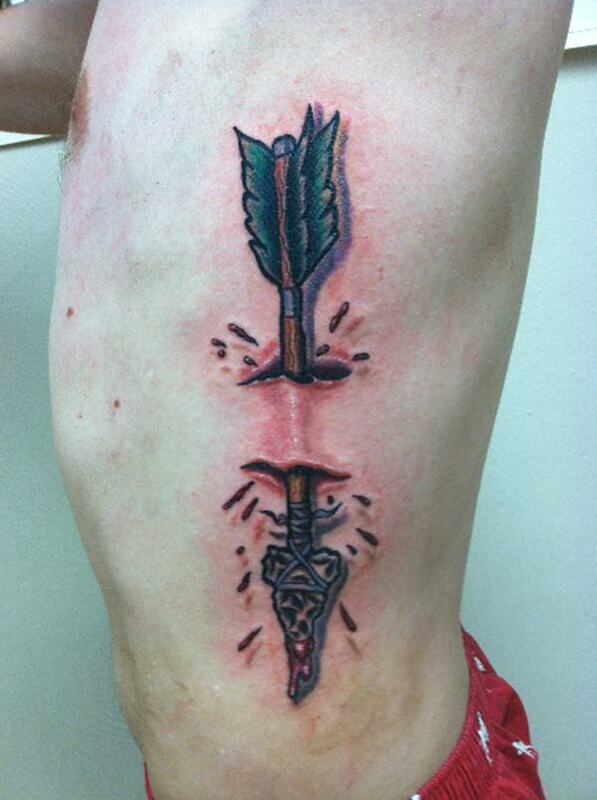 Along the spine is another popular spot for an arrow tattoo, but we feel like we should want you: that really hurts. The spine is actually one of the most painful places to get a tattoo – your spine is made up of 26 bones, and 24 of them go from your neck to the base of your back. That means that each tattoo you decide to get along them will hurt. If you’re not a big fan of pain, you might want to reconsider your tattoo placement. This of course comes down to your own preferences, but certain designs carry a deeper symbolic meaning you should be aware of before making a choice. 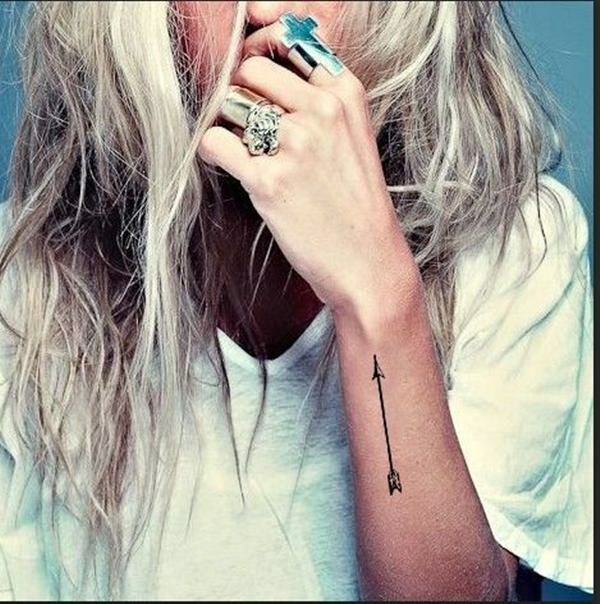 A single arrow is one of the most widely uses arrow tattoo designs, and it can signify protection from negative forces. As we’ve already said, it can also mean that you want to move forward, despite what hardship life might throw in your direction. 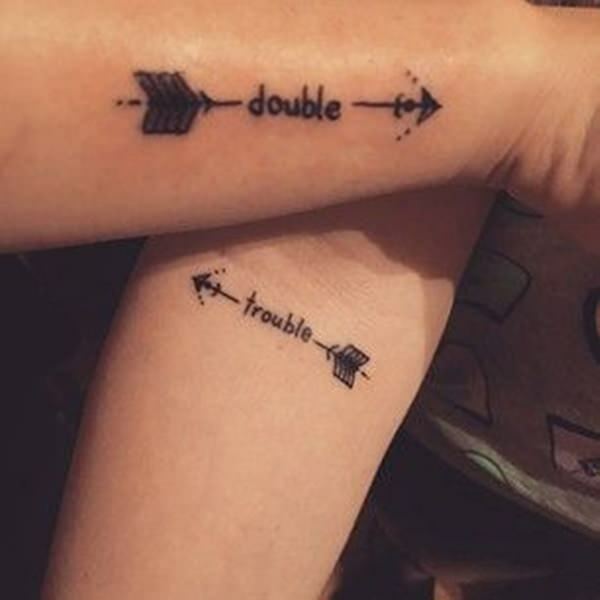 If you want to get inked with two arrows that cross each other, this is the perfect design for a matching tattoo to get with your best friend. Be aware though – if the arrow point away from each other, this usually signifies war. If you fancy such a design, it can maybe symbolize a war that’s going on within. Pretty deep stuff, don’t you agree? A broken arrow, on the other hand, can symbolize pain, a broken path, or a love story gone bad. 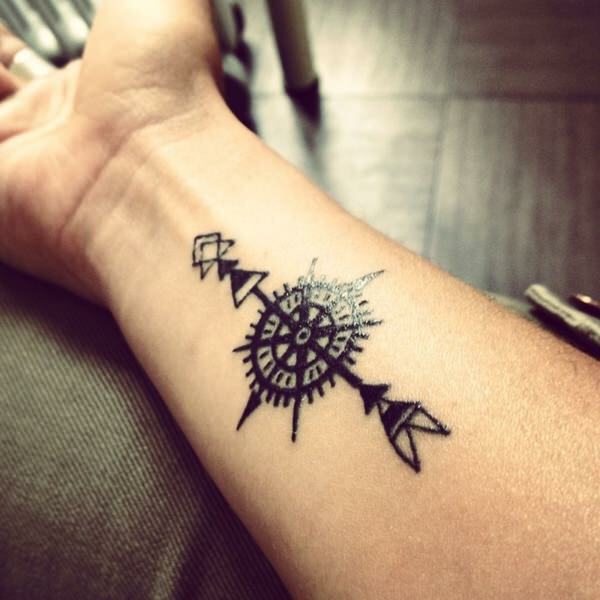 On the other hand, it can also symbolize making peace, since the arrows pointing away from each other depict war. As you can see, this is all very subjective, and that’s exactly why you’re the only one who can decide the personal meaning a certain arrow tattoo design has for you. 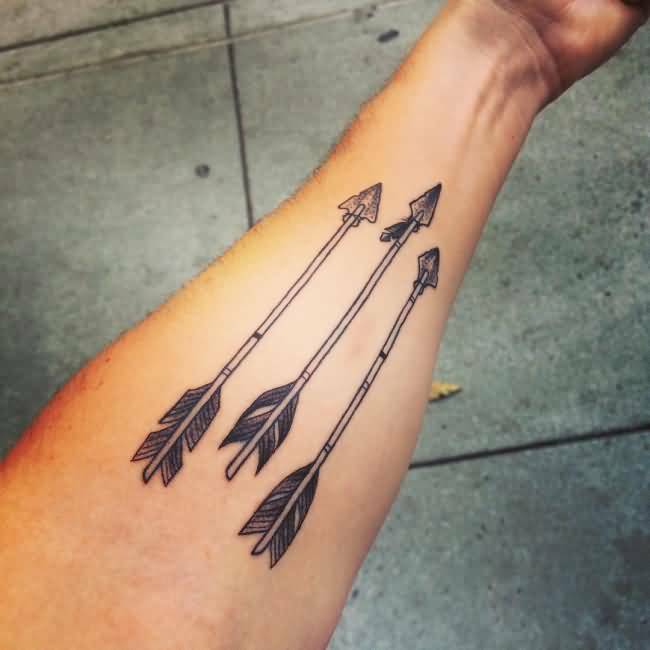 Last but not least, a bundle of arrows can signify unity and strength – an arrow is much easier broken when it stands alone that when it’s in a bundle. Such a tattoo can stand for your love for your family, a group of friends, or another type of group you belong too. The number of arrows one chooses to be in the bundle is usually the number of people in said group. 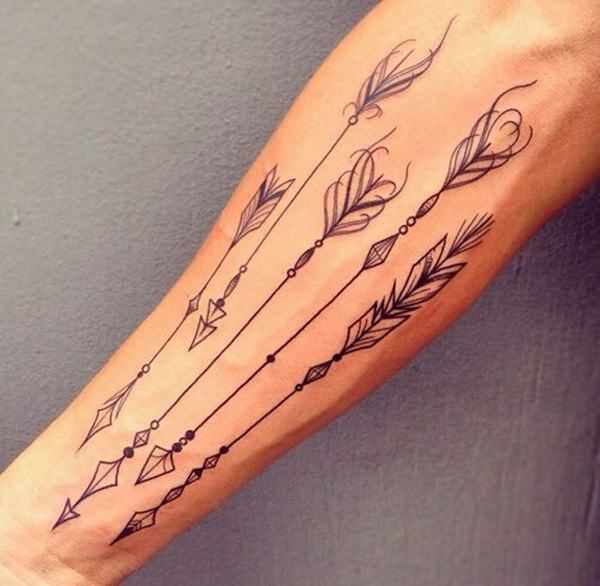 An arrow can also be accompanied by other design elements, for a more sophisticated tattoo. An arrow passing through a heart is usually, as you might have already guessed, a symbol for a broken heart and pain in love. 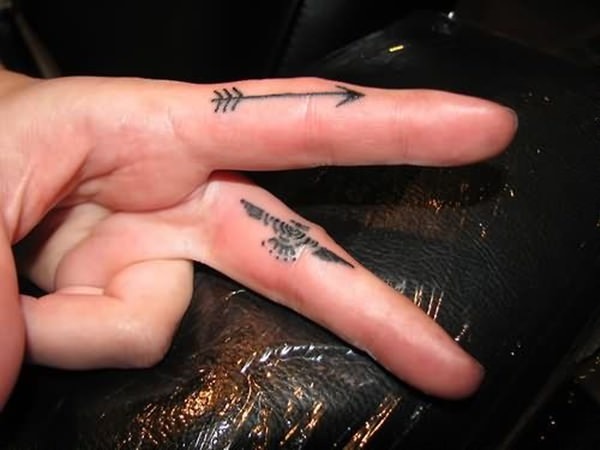 If the arrow passed through a diamond, on the other hand, that’s a symbol for courage and success. 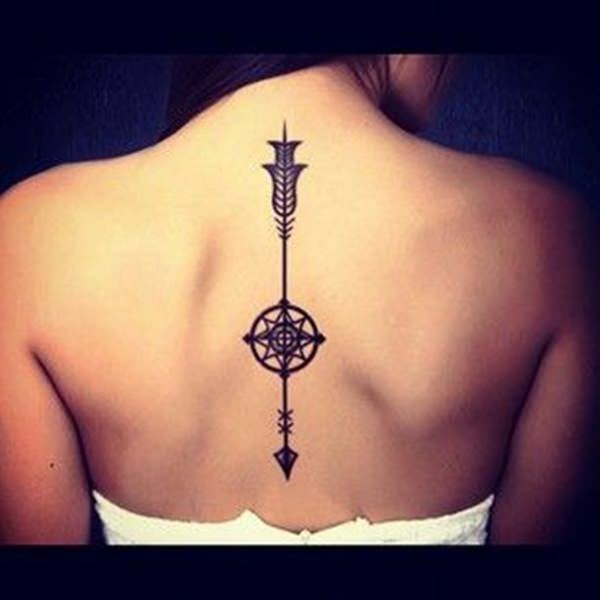 If you decide to get an arrow with a compass, this represents direction – maybe you’re now choosing a path in life, or you’ve decided to adopt a more Zen attitude and go whenever life takes you. 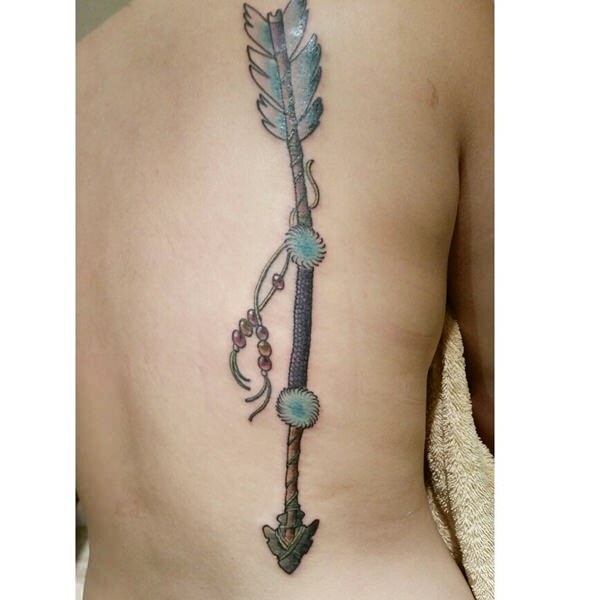 Another popular design features a bow with an arrow ready to be shot; a symbol that you’re ready for the greatest things that lay in your future. Or you can choose from another multitude of design elements to accompany your arrow – flowers, a dreamcatcher, feathers, and so on, each with their own particular meaning. 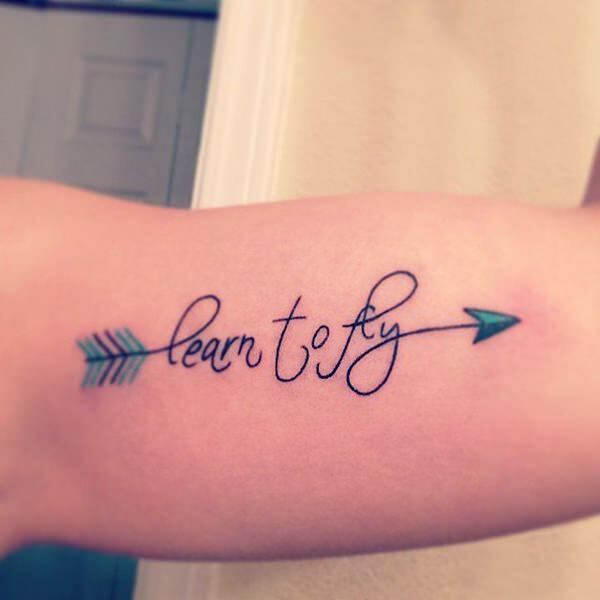 As for the colors, you can either opt for a simple black arrow, which makes for a more subtle tattoo, or you can use color, especially if the arrow is among other design elements, which makes for a more eyecatching and vibrant design. Again, it all comes down to your personal preferences and the placement of the tattoo. Getting a tattoo is a major decision, so you should ponder upon it for a while, especially if we’re talking about the first time you get inked. It’s good to have a few questions ready for the tattoo artist, so you are sure you’re making an informed choice. First off, ask them about their previous experience and qualifications. Their skill and expertise are the main factors that determine the quality of your body art, so you want to be positive you’re picking a professional. Also, ask them to show you their portfolio, so you can figure out if their style matches your needs. Besides, you should make sure they properly sterilize their tattoo equipment. Getting a tattoo in a shady place may save you some bucks, but this isn’t exactly something you should skimp on. 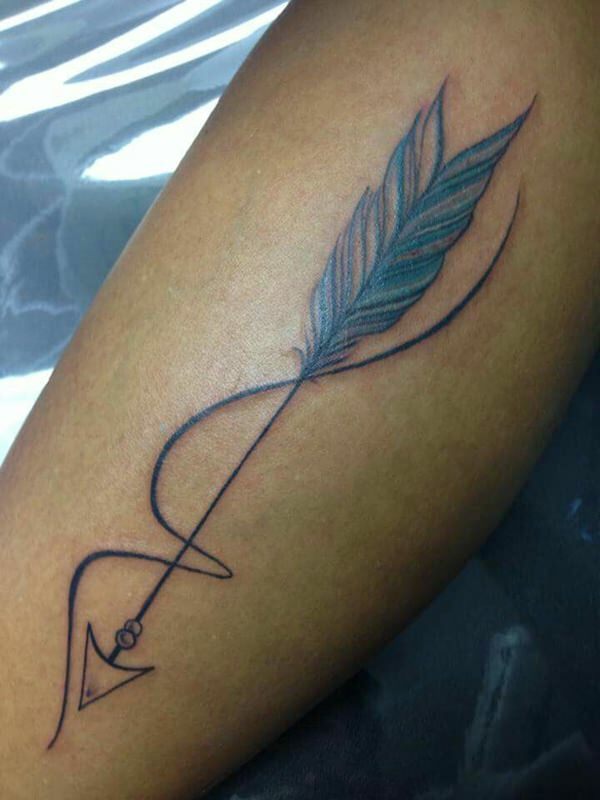 After the tattoo is done, ask about aftercare; they will usually recommend products and healing techniques to keep your tattoo looking fresh and gorgeous for a longer time. 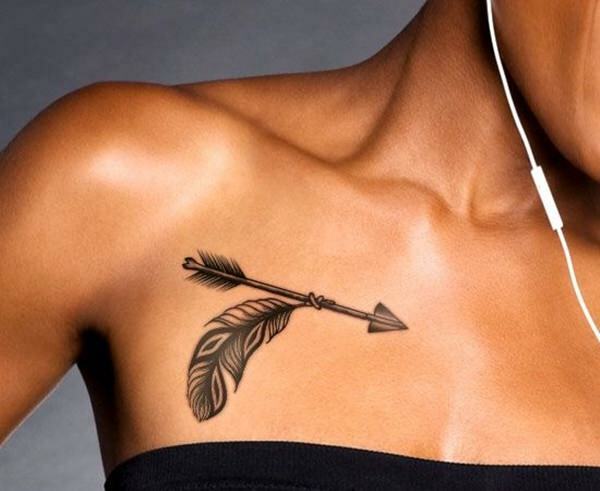 Still set on the idea to get an arrow tattoo? We can’t blame you, as they’re incredibly attractive. 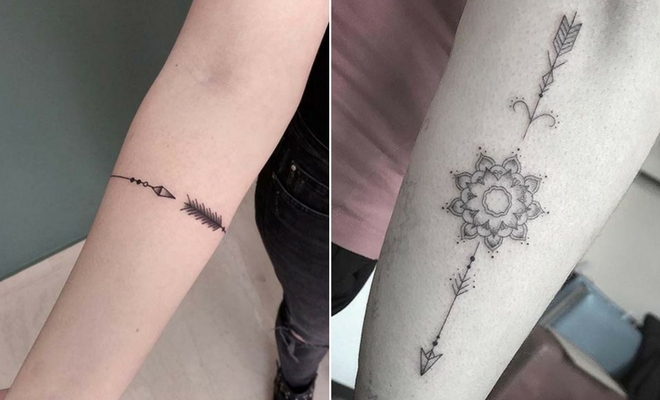 We’ve gathered 50 arrow tattoo designs for you below, to get you inspired and help you make a better decision. Which one will it be? Getting a tattoo on the spine will hurt, but the pain is worth it if you end up with such a gorgeous design. Adds an air of mystery, don’t you agree? Looking for direction in life? Moving forward? 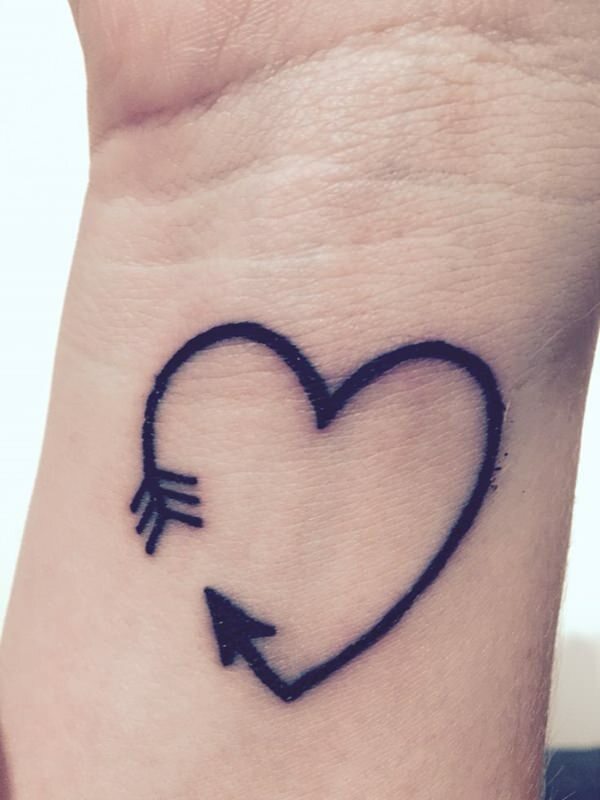 Whatever this arrow tattoo means, we’re big fans. It’s simple but oh so effective. 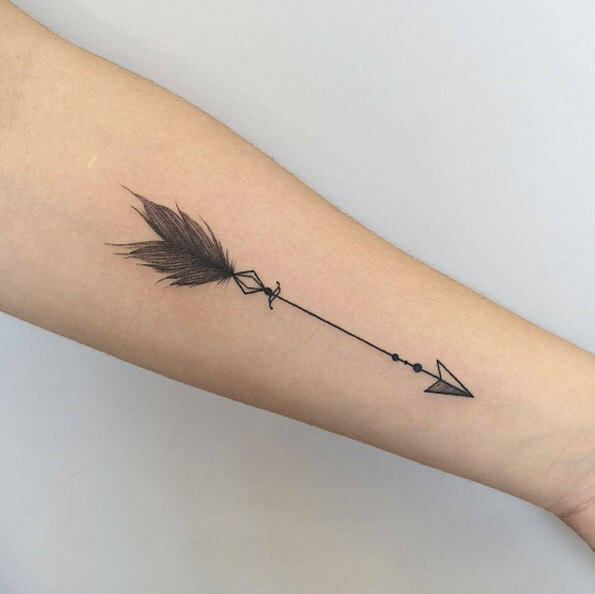 We love this sophisticated arrow tattoo, and the fact that the owner decided to keep it black gives it even more elegance somehow. Simple, classy, and still gorgeous. 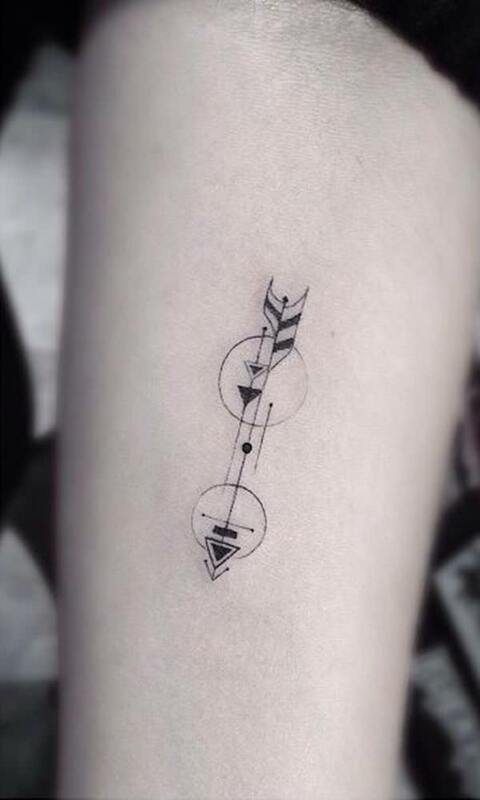 Plus, the placement of the tattoo is particularly well-chosen here and works well with the length of the arrow. Another simple, but wonderful piece of body art. 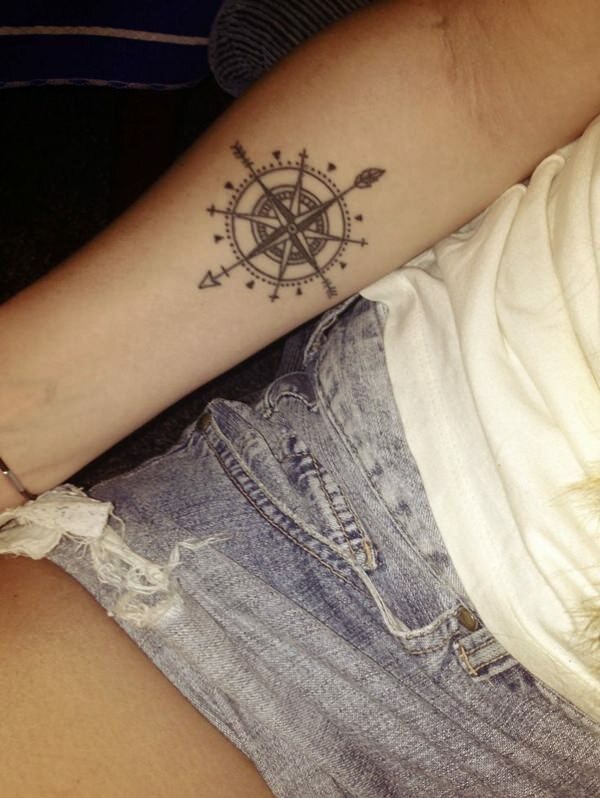 If you choose this kind of placement, you will see your tattoo quite often, so make sure you pick a design you won’t get bored of or one that has a deep meaning for you. 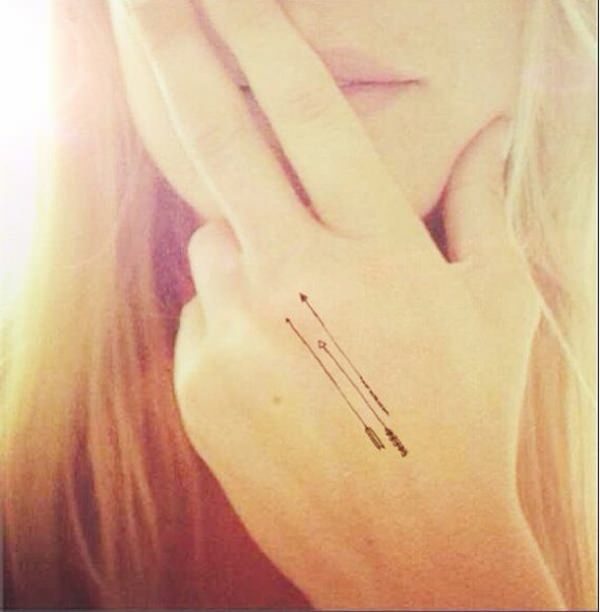 As we’ve already said, a group of arrow usually signifies strength. And the design of this tattoo is quite powerful, so we’re not going to argue with the symbolism. Why not use a quote to emphasize the power of the arrow? 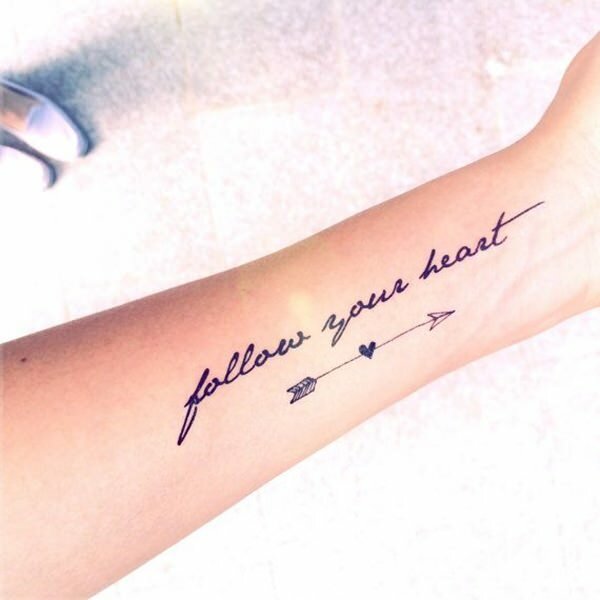 “Follow your heart” is a fitting one, especially if you’re the kind of person who enjoy following their own path instead of going the traditional route. I’m always going forward, never looking back. Do you think this is what the owner of this tattoo had in mind when choosing this design? The placement of the body art seems to hint to that. 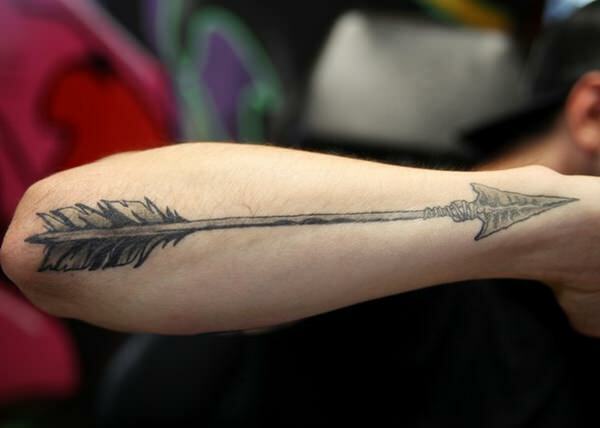 The amount of detail in this arrow tattoo is quite impressive. We’re big fans. 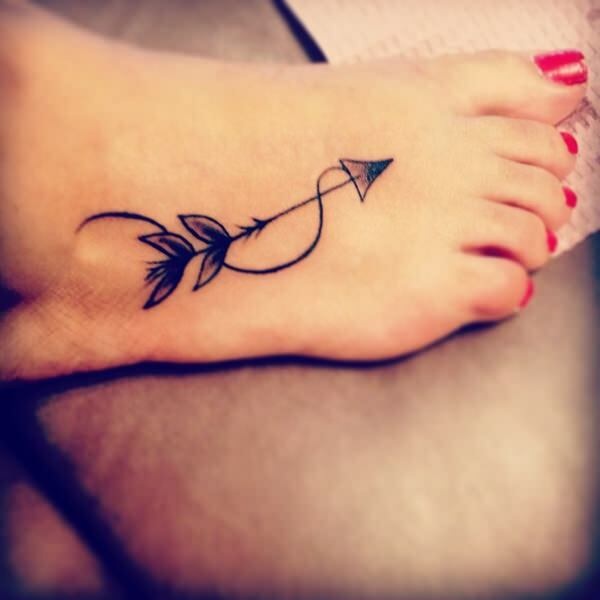 Another arrow placed on the foot, which, again, seems to symbolize moving forward. This one also has an interesting spiral attached which gives it a certain edge. The crossing arrows which symbolize friendship make a special appearance. We’re guessing the owner values her friends a lot. And hopefully so do you. Stunning design, awesome quote. And perfect to look at when you need just a bit of motivation to help you overcome an obstacle or reach a goal. Another impressive and sophisticated design any tattoo artist would be proud of. We like the head of the arrow in particular. Feathers can have several meanings since they’re associated with birds, creatures that possess the ability to fly. They usually signify freedom, triumph, liberty, or independence. 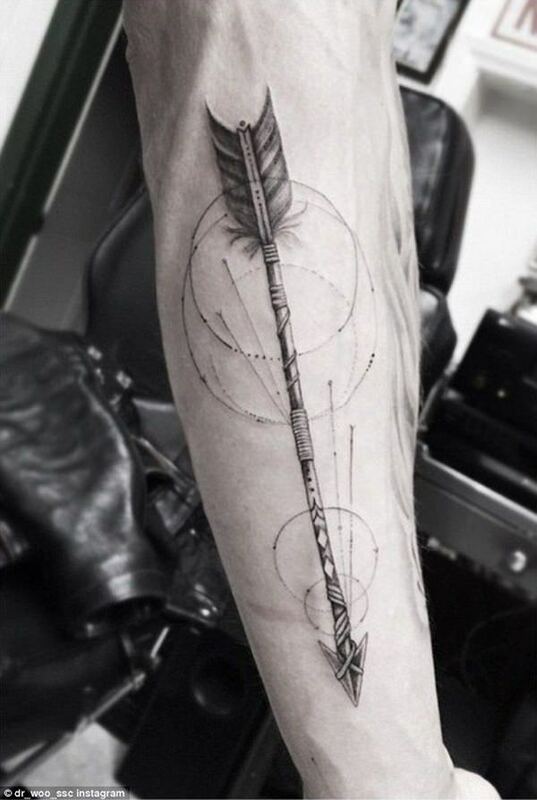 It makes sense to use a feather as a design element to accompany your arrow tattoo. 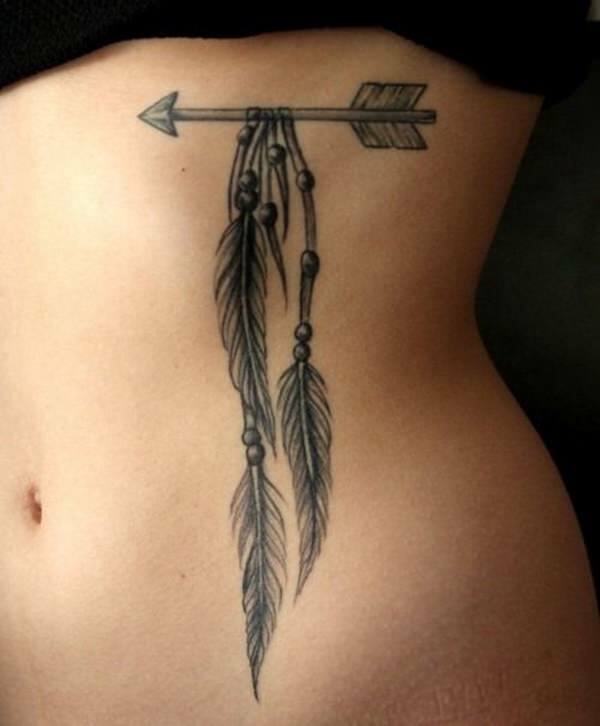 An arrow facing down symbolizes peace in the Native American Indian culture. Do you think this is what the owner of the tattoo was going for? Either way, it looks amazing. The arrows above are pretty similar, but they are all unique. Using geometry symbols can be a great way to personalize an arrow and make it more true to who you are. Whether you use squares, circles, lines, or hexagons, you will surely stand out from the crowd. You can ask a designer friend to help you come up with a one of a kind tattoo design – that way, you will be sure no one has a similar one. Or, you can play around with design programs to make your own from scratch. Most tattoo artists are also willing to come up with something for you as long as you’re clear about what you want. You just need to decide on what elements you want to include in the design, pick fonts if there are any quotes involved, and explain what you would like the end result to communicate to the world. Double trouble! 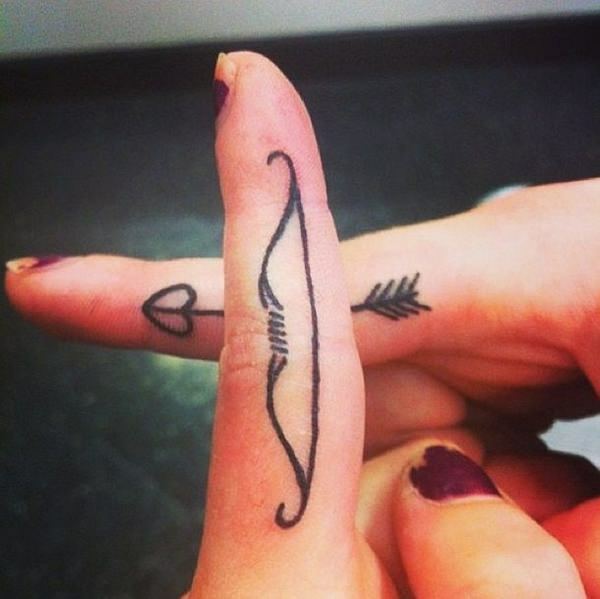 This is a great idea for a matching tattoo to get with a close friend or – why not – your significant other. Your bond will only grow stronger. Alternatively, you can get both tattoos on your arms and dazzle people when you cross them. Great use of color here. The tattoo makes a splash, literally. And it still moves forward despite being broken in the middle, which can send an important inspirational message. Looking for direction in life? Isn’t everyone? At the end of the day, none of us knows what they’re doing. We just cross our fingers and hope for the best. A powerful tattoo that will help you remember who strong you are and how courageous you can be. You don’t scare easily. You’re ready to tackle everything that comes your way. The true meaning of a #Girlboss. 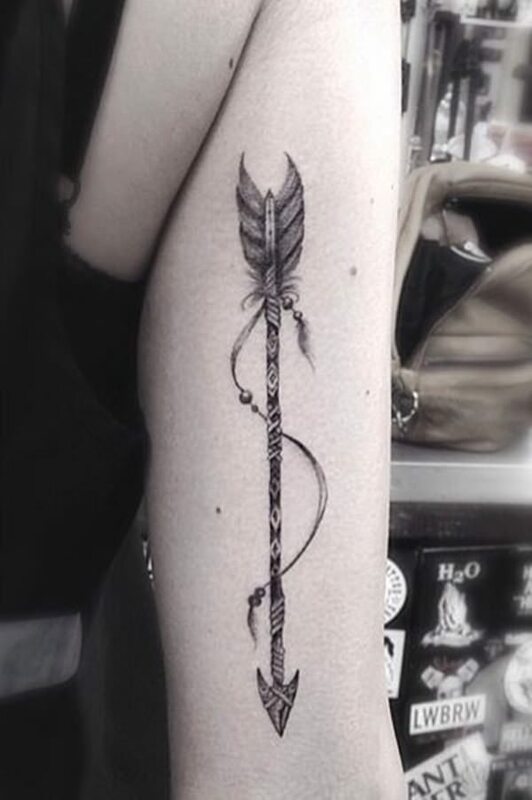 Lovely use of feather alongside an arrow tattoo. 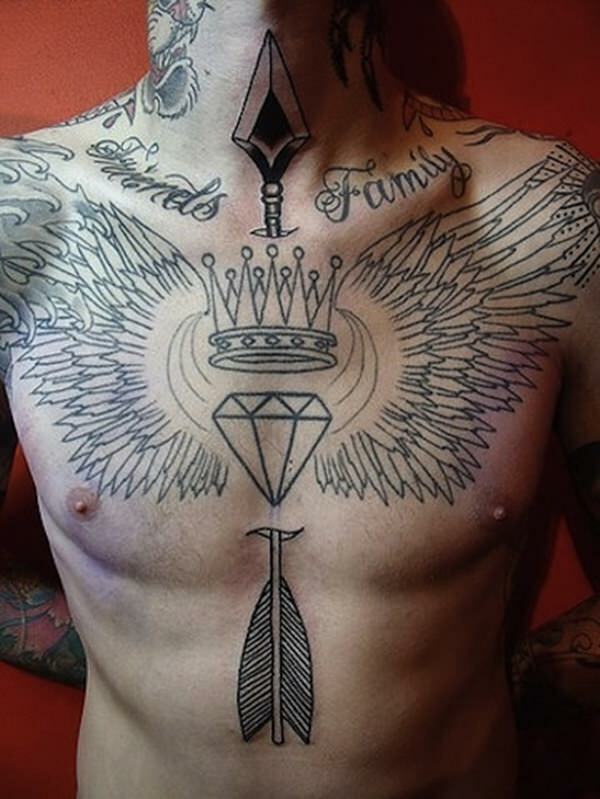 We especially appreciate the placement of the tattoo here, since the feathers seem to be flowing so natural. We’re ready to bet that the owner of the tattoo chose this design to symbolize strength and masculinity. Just look at the size of the thing. It’s majestic. The arrow might have encountered some obstacles along the way, but it’s still moving forward. 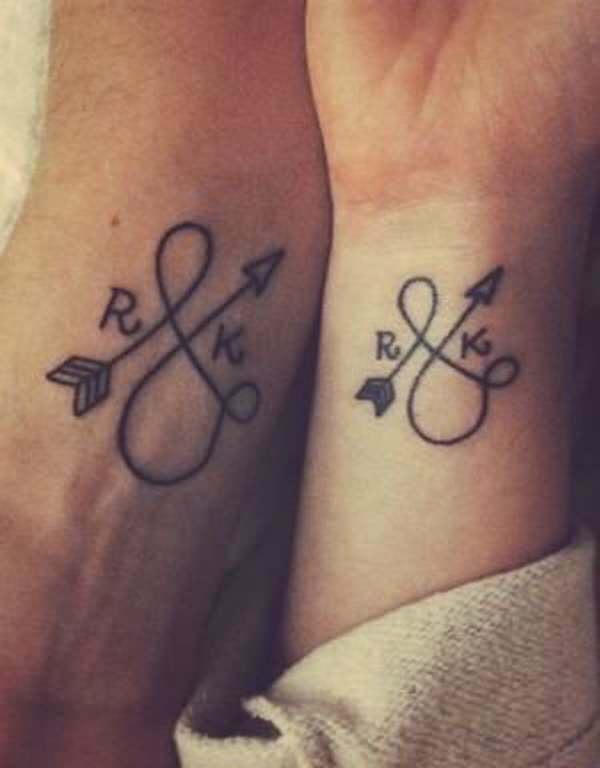 Again, an awesome example of a matching tattoo you can get with your significant other, since you can use your initials. Fitting if you had to go through a lot to finally be together. I am strong, I am invincible! Such a tiny tattoo, such a powerful meaning. Miley Cyrus has the habit of tattooing her fingers as well, so you can be sure your tattoo will be on fleek. Another sophisticated design which makes great use of geometry symbols. We’re in awe. Pain in love? Maybe waiting for someone to complete the heart? Maybe just emphasizing that one person is enough, they just need to fight a little to realize that? 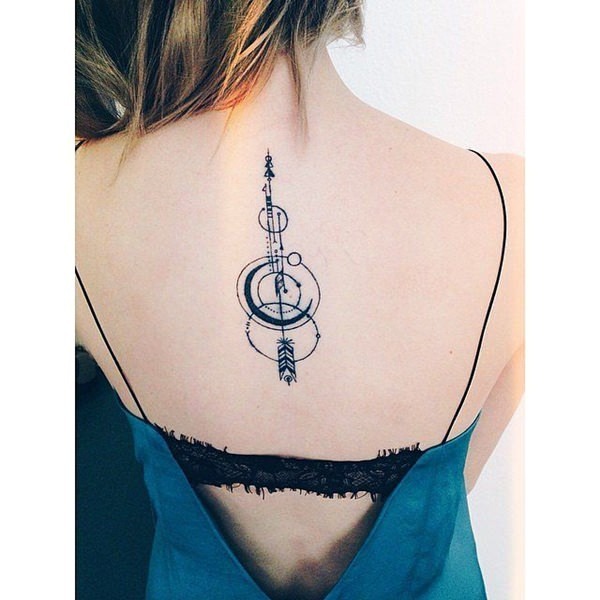 We don’t know what the owner had in mind when she opted for this tattoo, but we can help but appreciate the simple and elegant design. Another bundle of arrows, each of them unique in their own way. Perfect if you want it to signify a certain group – like your family or your friends. 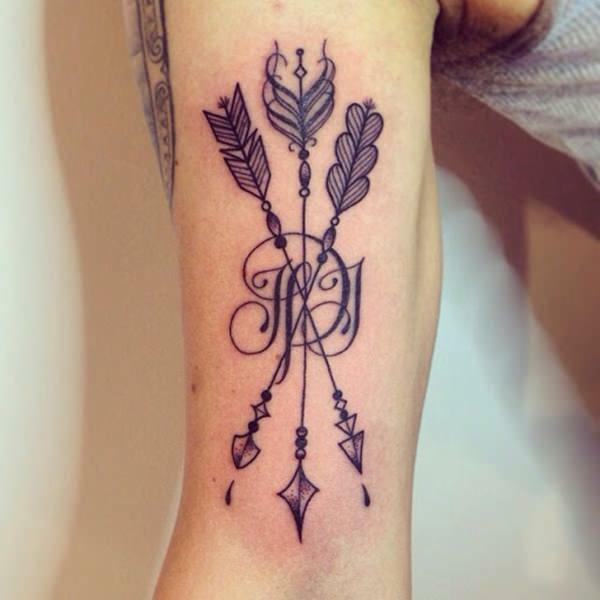 Three lovely arrows intersecting and some initials where they all come together. Maybe it signifies a special moment where three lives had come together. We can only speculate. A broken arrow with some awesome design elements! The use of color here is perfect, and the 3D effect is surely eyecatching. 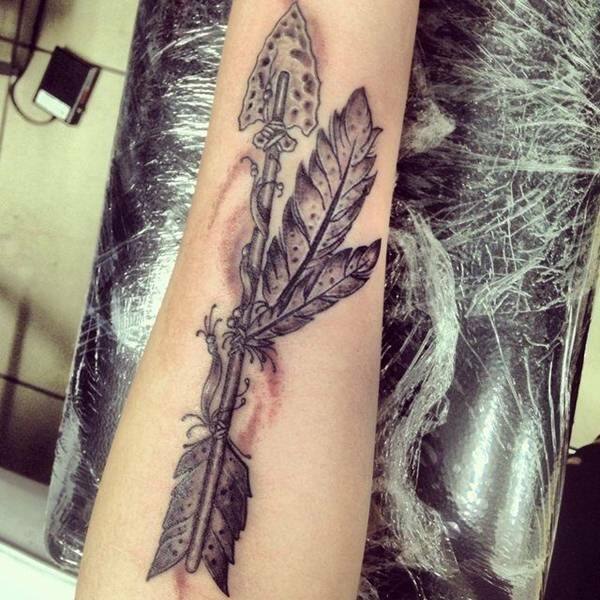 A detailed design and we’ve got arrows and feathers together again. Woop woop! The arrow might be broken, but it’s still in perfect shape. Maybe the owner of the tattoo had to go through some sort of hardship and ended up victorious. We’re rooting for them. That is one imposing arrow, we’ll give you that. Delicate, with a hint of color and great details that help the tattoo stand out from the crowd. We’re going to want the name of the artist. Impressive design, just the perfect size, and well-picked placement. A design that was surely made to impress. And we are. 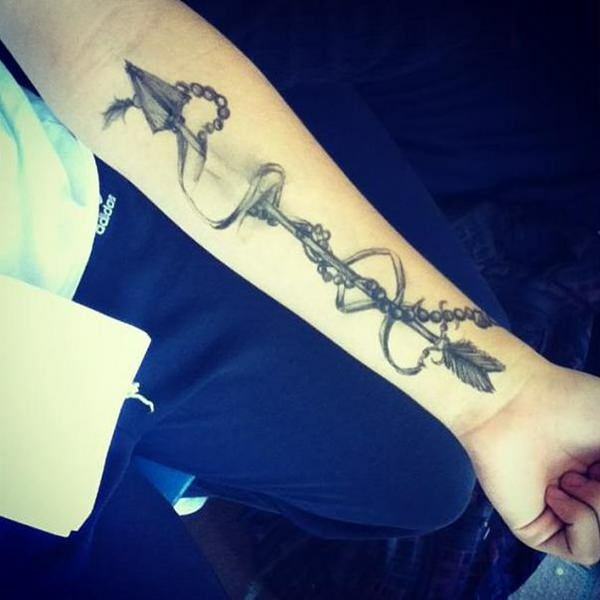 A tattoo that encompasses many symbols, but the arrow still stands out from the crowd. 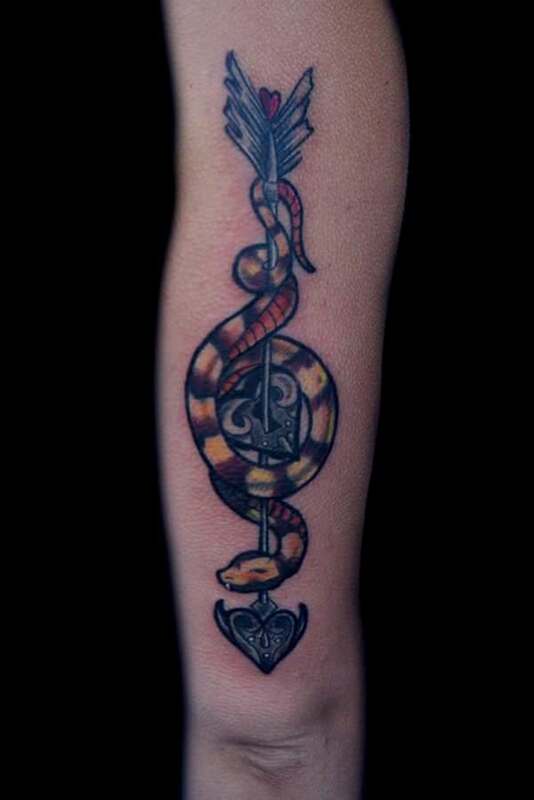 Snake tattoos are classic, and they usually symbolize birth, magic, or mystery. Whatever it is, we love the use of colors here. It definitely helps the design be more vibrant. 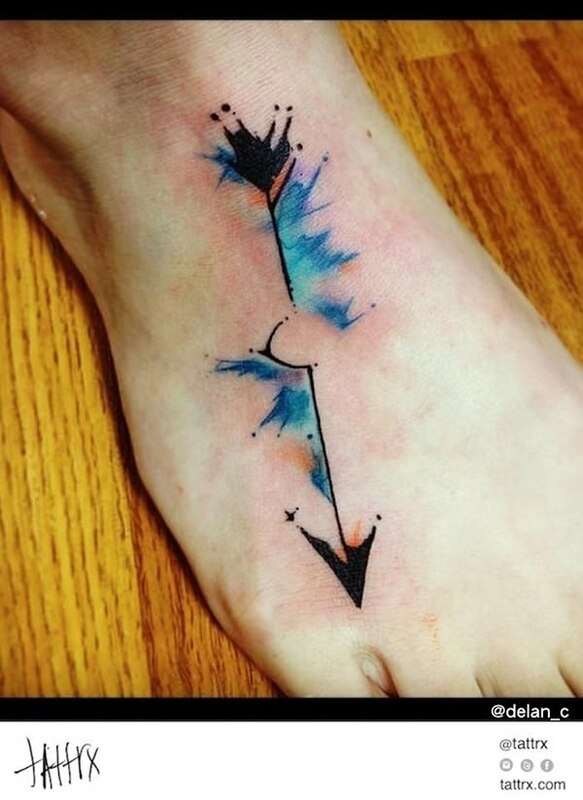 A big arrow for an even bigger and more impressive tattoo design. We totally approve. Simple, elegant, conspicuous. The tail is especially stunning. 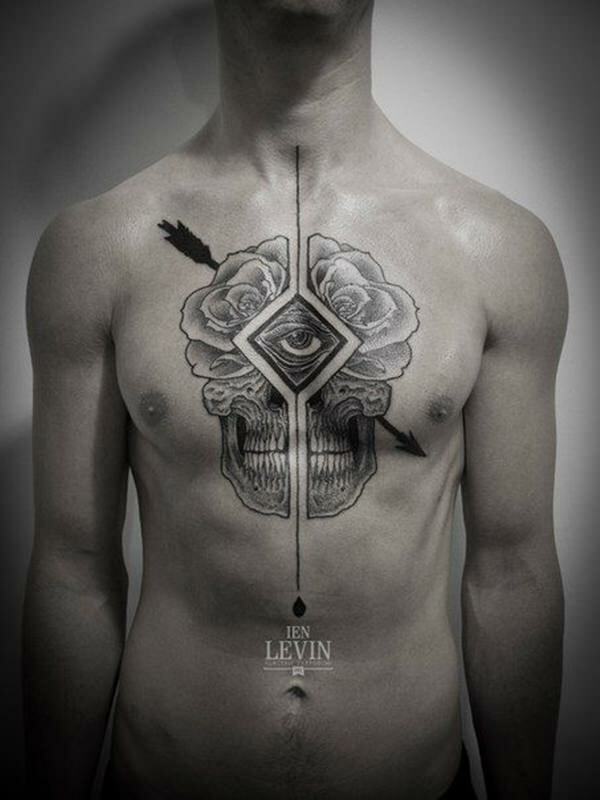 A subtle, yet powerful piece of body art, perfect if you’re a tattoo novice. Did you ever think of getting both the bow and the arrow? This design showcases how good these two elements work together. If you’re bold enough, you can use the arrow as an element in a larger design, as shown above. Another great example of how good two design elements can work together. 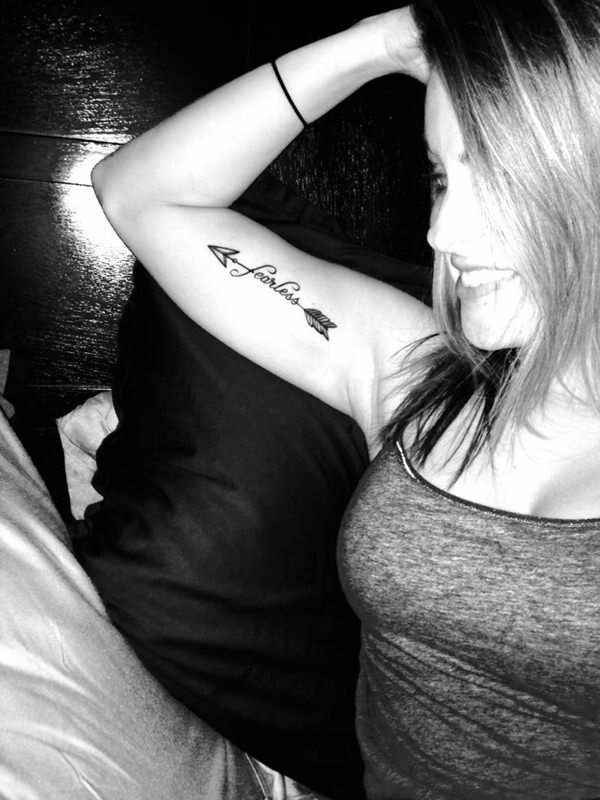 Enlisting the infinity symbol in your tattoo – cool or too common? We vote cool. We’re still in love with it. 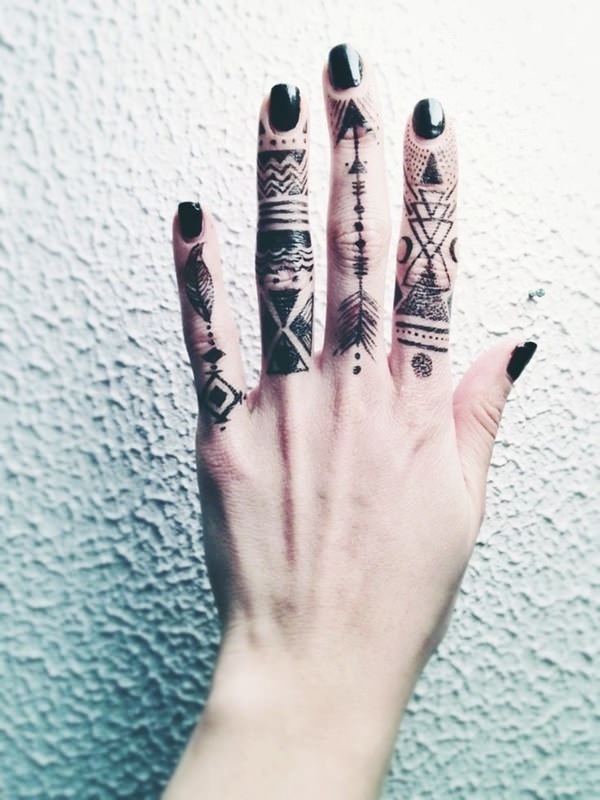 Ready to get inked? Choose a tattoo artist and discuss your design idea with them. And whatever you do, never show take drugs or drink alcohol on the big day, thinking it will numb your pain. Most tattoo shops won’t tattoo you if you are inebriated, since it can cloud your judgement. Feel the pain and trusts us – it will be incredibly empowering. Good luck!